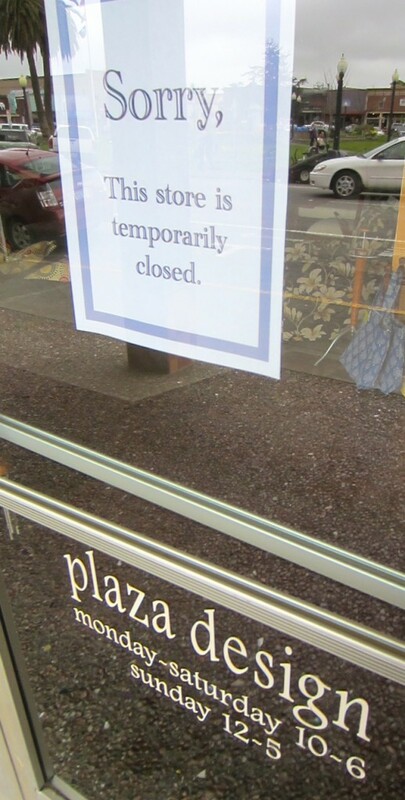 PLAZA – The Arcata Economic Development Corporation (AEDC) has seized the assets of Plaza Design. AEDC representatives appeared at the business along with a locksmith last Thursday, March 1, according to a story in the North Coast Journal. The story said customers and store personnel were escorted out and the locks changed. The action was taken to secure the store’s merchandise, which now belong to AEDC, according to Susan Seaman, AEDC program director. The lender made a small business loan to Plaza Design a few years ago. Seaman wouldn’t disclose the amount of the loan to Plaza Design, but a 2009 document on the website for the Headwaters Fund, which funds loans through AEDC, listed an oustanding balance on June 30 that year of $234,856.02. Some indication of the business’s failure had apparently been in the wind, as a few consignees had withdrawn their merchandise in weeks leading up to the closure. Seaman said the action was taken to protect creditors, including customers who may have paid for items as well as artists, craftspeople and others who had items there on consignment.Seaman said AEDC was now attempting to contact the numerous creditors consignees, beginning with those who had called the organization asking if they were going to get what they were owed, or their property back. Seaman said AEDC supports businesses which show a lot of promise and sometimes carry greater-than-average risk. Plaza Design was founded by Julie Fulkerson 30 years ago. It was originally located in Jacoby’s Storehouse, but later moved to its present location in a building still owned by Fulkerson. She sold the business to current owners Jane and Peter Labes, who have declined comment. This entry was posted on Wednesday, March 7th, 2012 at 12:56 pm	and is filed under News, Business. You can follow any responses to this entry through the RSS 2.0 feed.